ActivityMaster is a new utility for Microsoft Train Simulator, that gives users more control over all their MSTS Activities, including the Weather, Season, Start Time, and most importantly, all rolling stock (cars and engines) used in the activity. It sells for $14 US. 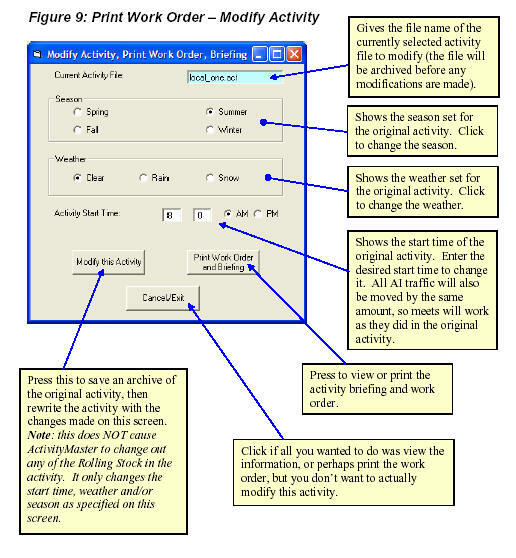 Activity Master allows you to take control of your activities, downloads, and rolling stock inventory. 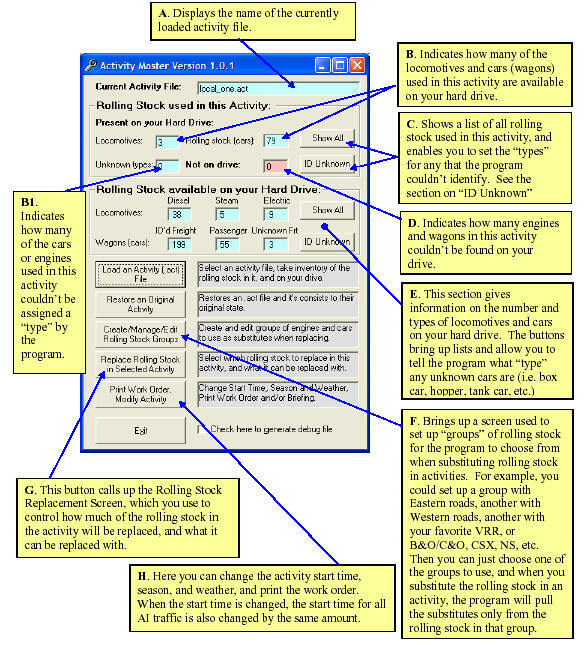 NEVER DOWNLOAD ANOTHER PIECE OF ROLLING STOCK AGAIN just to run an activity! Put the cars and locomotives you downloaded and purchased to work in ANY activities you have! Download and run activities from any author, WITHOUT downloading any of the "required" rolling stock! Instead, run the activity with your preferred freight or passenger cars and engines. Change the Weather, Season and Start Time for any activity. All AI traffic is also changed by the same amount. Try out those "Night Cabs"! Print the briefing and work order for any activity. Substitute Steam engines for Diesel, or Electric, or vice-versa (route must be electrified to run electric locomotives). Choose the locomotives you'll drive in any activity. Safely backs up activities and their consists before modifying them! Built in "Activity Restore" feature - if you don't like the changes the program made, hit a single button to return everything back to it's original state! View 3d pictures of the rolling stock and engines you're replacing (if it's on your hard drive), along with 3d pictures of the rolling stock and engines you'll be replacing them with, thanks to a new interface to Paul Gausden's great freeware Shape View utility (used with Paul Gausden's permission, THANKS PAUL!). You can get the free Shape View program here (Skyline Computing does not re-distribute this program). Read a thread on the 3D Trains Forum discussing Activity Master here (the Activity Master discussion is towards the end of this thread). Go to the home page to order! 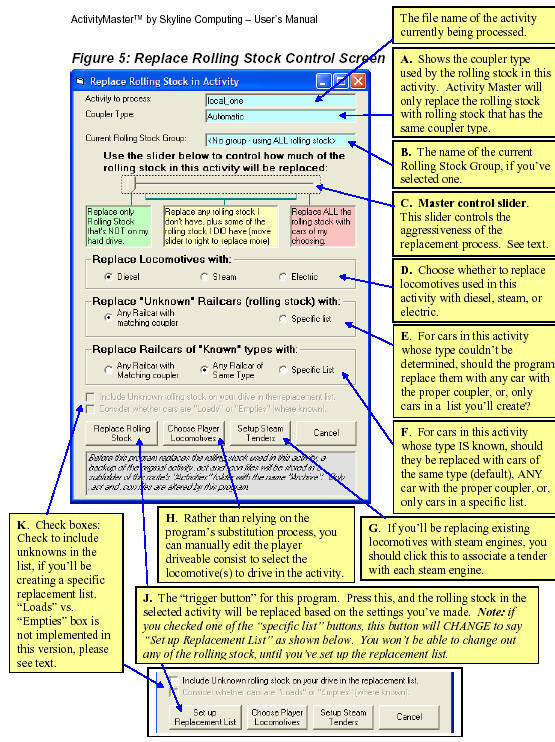 Download the full User's Manual (as a PDF, requires Adobe Acrobat reader), for free, here.